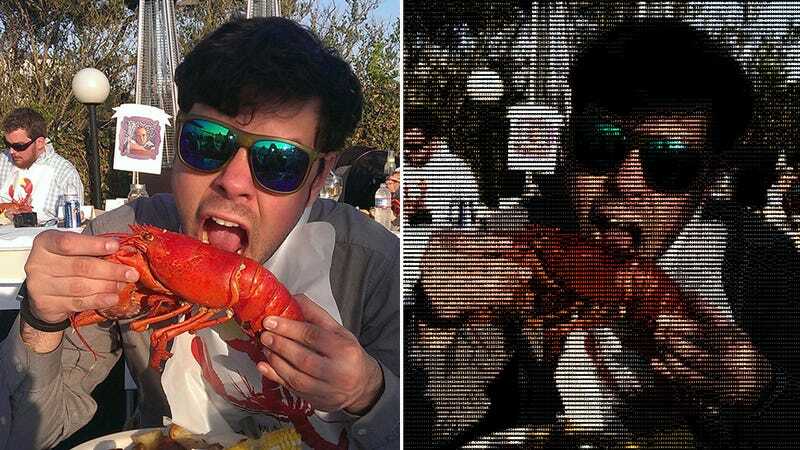 We’re not exactly sure why they’re doing it yet, but a self-described ‘Web standards fanatic’ named Mathias Bynens has discovered that Facebook and Instagram are automatically making ASCII art versions of every photo you upload. And accessing the lo-fi versions of your images is super easy. On the left we see Gizmodo Editor-in-Chief Katie Drummond trying out the Oculus Rift at CES earlier this year, and on the right is the retro ASCII version of that same image you’d have probably found on the earliest versions of the internet. As Mathias explains in this tweet, to access the fully-editable ASCII versions of your Facebook or Instagram shots you first need to find the specific URL for the image, and then append either .txt after the .jpg extension for the basic black and white ASCII art version, or .html after the .jpg extension for the vastly superior colored ASCII art version. Now as to why Facebook is doing this with all of its uploaded photos is unknown. It’s doubtful it’s an attempt to make its images accessible via very, very old devices, nor is it a way to make either site’s content available in countries with limited internet access. Because while the ASCII versions of these photos certainly have a retro charm, there’s a good reason we left ASCII art behind decades ago: they’re pretty crappy.